Ben Bernanke (b. Ben Shalom Bernanke December 13, 1953) is the current chairman of the Federal Reserve, the central bank of the United States. During his time as chairman, Bernanke has managed the Federal Reserve’s response to the American financial crisis of the late 2000s. 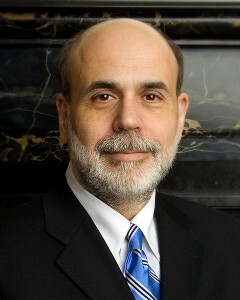 Before accepting the position of Federal Reserve chairman, Ben Bernanke served as a professor at Princeton University. He chaired the economics department from 1996 until September 2002. At that time, he chose to go on public service leave. Bernanke would eventually resign from the position in July of 2005. From 2002-2005, Ben Bernanke was a member of the Board of Governors of the Federal Reserve System. During this period, he also proposed the Bernanke Doctrine and first introduced “the Great Moderation,” an extensive theory that explained how traditional business cycles have decreased in volatility in the past few decades due to structural adjustments in the international economy. In particular, it focused on the economic stability seen in developing nations. Ben Bernanke earned his bachelor’s degree in economic history from Harvard University in 1975 and earned his doctorate degree in economics from Massachusetts Institute of Technology in 1979. Bernanke’s wife Anna is a schoolteacher at the National Cathedral School. The couple met on a blind date while they were both students. She attended Wellesley College, while he was pursuing a master’s degree from MIT. The Bernankes have two children – one son and one daughter. They resided in Montgomery Township of New Jersey before their move to Washington, D.C.
After completing his doctoral studies at Massachusetts Institute of Technology, Ben Bernanke elected to pursue a teaching career. Starting in 1979, Ben Bernanke was a faculty member at the Stanford Graduate School of Business for six years. He also taught as a visiting professor at the prestigious New York University, and later became a tenured professor in the Department of Economics at Princeton University. In February of 2006, President George W. Bush appointed Ben Bernanke to a 14-year term as a member of the Federal Reserve Board of Governor. Additionally, he was selected to serve a four-year term as the Federal Reserve chairman. In this leadership role, he is a member of the Financial Stability Oversight Board that manages the Troubled Asset Relief Program. He also works as Chairman of the Federal Open Market Committee, the principal monetary policy making body of the System. In February of 2006, President Bush appointed Bernanke as the United States Federal Reserve chairman. He received confirmation for a second term in January of 2010 after a nomination from President Barack Obama. To secure this second term, Bernanke received a 70 – 30 vote from the full Senate. Ben Bernanke has offered numerous lectures on monetary policy and theory at the London School of Economics. He has also written four textbooks – three on macroeconomics and one one on microeconomics. He was listed among the most published economist by the economic journal IDEAS/RePEc. Ben Bernanke was the Director of the Monetary Economics Program of the National Bureau of Economic Research and the editor of the American Economic Review. Ben Bernanke has received multiple awards for his achievements. In 1997, he was named a fellow of the Econometric Society. He would receive the same designation from the American Academy of Arts and Sciences in 2001. Columbia Business School presented him with the Distinguished Leadership in Government Award in 2008. During the next year, Bernanke earned two major honors. In February of 2009, the South Carolina Department of Transportation (SCDOT) Commission resolved to name Exit 190 along Interstate Highway 95 the “Ben Bernanke Interchange.” In December, Bernanke was named the TIME magazine person of the year. Bernanke, Ben S. (June 1983). “Nonmonetary Effects of the Financial Crisis in the Propagation of the Great Depression”. American Economic Review 73 (3): 257–276. JSTOR 1808111. Bernanke, Ben S.; Blinder, Alan S. (September 1992). “The Federal Funds Rate and the Channels of Monetary Transmission”. American Economic Review 82 (4): 901–921. JSTOR 2117350. Bernanke, Ben S.; Gertler, Mark; Watson, Mark (May 27, 1997). “Systematic Monetary Policy and the Effects of Oil Price Shocks”. C.V. Starr Center for Applied Economics. Bernanke, Ben S.; Laubach, Thomas; Mishkin, Frederic S.; Posen, Adam S. (2001). Inflation Targeting: Lessons from the International Experience. Princeton University Press. ISBN 0-691-08689-3.